The African Queen (1951) is one of the 1001 classic movies you should see. 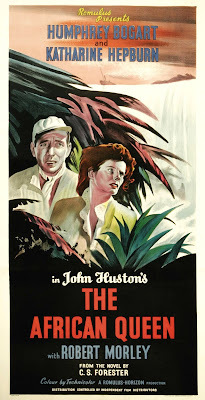 Katharine Hepburn plays a missionary to East Africa who falls for boat captain Humphrey Bogart in this classic romance set during World War I. Each Friday, I'm going to recommend a classic movie you should see (for the reasons behind the 1001 series and reviews of earlier films covered go here). This month I'm commemorating the 100th anniversary of the United States' entry into World War I by covering four films about the conflict. This week's selection is the classic romance The African Queen (1951). The African Queen tells the story of siblings Samuel (Robert Morley) and Rose Sayer (Katharine Hepburn), who are missionaries to German East Africa at the beginning of World War I. The village they live in is cruelly destroyed by German troops, and when Samuel eventually dies, Rose is forced to leave on a rundown boat whose skipper is the rough-around-the-edges Charlie Allnut (Humphrey Bogart). The unlikely couple eventually fall in love and decide to embark on a daring scheme to torpedo a German gunboat. The African Queen is based on a 1935 novel by swashbuckling author C.S. Forester. The rights to the screenplay had been floating around Hollywood studios for the better part of a decade before producer Sam Spiegel and director John Huston finally got enough financing to shoot the movie on location in Uganda and the Democratic Republic of Congo. 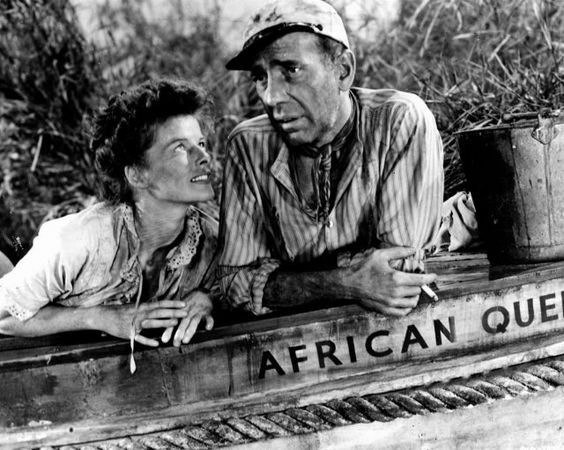 The result was a massive hit that earned Bogart his only Academy Award, and The African Queen has since become one of the most beloved and well-known among Old Hollywood Films. During the 1950s, World War I mostly receded into the background while old Hollywood filmmakers churned out movies about World War II and its aftermath. The films made about the conflict were mostly gauzy costume pieces like the Doris Day musicals On Moonlight Bay (1951) and By the Light of the Silvery Moon (1953). Huston and screenwriter James Agee capitalizes on that nostalgia factor in The African Queen, In fact, they use World War I as the movie's McGuffin; the German soldiers who destroy the Sayer's mission are stock villains who set in motion the movie's unique mixture of action-adventure spectacle, exotic scenery, and unlikely romance. 1. Location shooting. The cast and crew faced several challenges during the filming, but, other than illness, none was more daunting than trying to lug the cumbersome Technicolor cameras around the jungle. However, the gorgeous footage that resulted was well worth the sacrifice. 2. Hepburn. Bogart is both very funny and very touching as the gin-soaked Charlie, but, it is Hepburn, who was instructed to play the role like Eleanor Roosevelt by Huston, who gives the performance of the film. Hepburn's Rose evolves from a pious missionary to determined freedom fighter to tender woman in love in what is perhaps Hepburn's greatest screen role. 3. Middle-aged romance. One of the reasons the studios were reluctant to produce The African Queen was because they thought that audiences would be turned off by a romance between two middle-aged people. Obviously that wasn't the case, and Hepburn and Bogart's quirky chemistry makes them one of old Hollywood's most endearing onscreen couples. 4. Morley. While The African Queen is a tour de force for both Bogart and Hepburn, but prolific character actor Morley quietly makes an impression as Rose's idealistic brother. 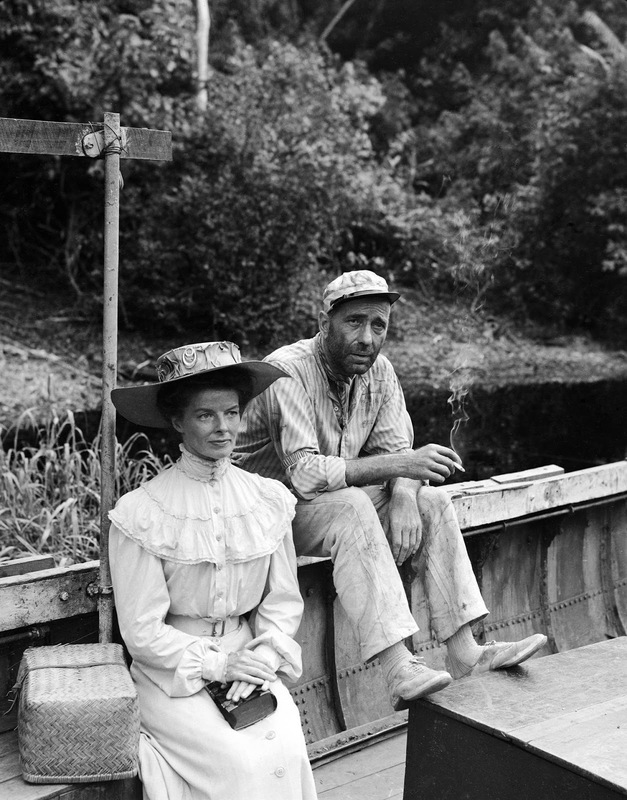 Katharine Hepburn and Humphrey Bogart take a break on the set of The African Queen (1951). Other critics: The African Queen has an 100 percent fresh audience rating on Rotten Tomatoes and Leonard Maltin writes that the film is "superb combination" of Bogart and Hepburn's talents in a 4 star review for his Classic Movie Guide. Critics in 1951 were enthusiastic about the movie, but they mostly saw it as an exciting escapist yarn. The Time magazine critic opined that "[t]he movie is not great art, but it is great fun," while Bosley Crowther of The New York Times referred to The African Queen as a both a "lark' and a "spoof" of the action-adventure genre. The African Queen "is a slick job of movie hoodwinking with a thoroughly implausible romance, set in a frame of wild adventure that is as whopping as its tale of off-beat love," he wrote. The Bottom Line: The African Queen is a fun summer popcorn movie with exciting action sequences and big-name stars at the top of their game. Watch it for the beautiful location scenery, heart-pounding river rapids sequence, an the unique love story between Charlie and Rose. Availability: The African Queen is available for streaming on Netflix Instant. It is also available on Blu-ray, DVD, and video on demand. Next Friday I'll wrap up the June theme by looking at director David Lean's masterpiece Lawrence of Arabia (1962). I adore Bogart as Charley Allnut. He probably deserved more than one Oscar, but I'm glad he received one for this role. Me too. It's probably his most endearing role. "Now that I've had a taste of it. I don't wonder you love boating, Mr. Allnut." I absolutely love this wonderful film. One scene that you didn't mention that will always stick in my head is the leech scene. Gives me the creepy crawlies just thinking about it! That scene always give me the creeps too. I read somewhere that celebrities were getting "leech therapy" to improve their health. I could not do that.